It was a shot heard around the world – or two shots rather – when yesterday New York and Massachusetts each took bold steps to accelerate distributed energy resources. New York ordered actions that begin placing a value on distributed energy resources, a key move in creating the kind of decentralized grid the state is pursuing under its Reforming the Energy Vision (REV) policy. REV envisions utilities acting as platform managers where a wide variety of players, including ‘prosumers’ – such as households with solar panels — can buy and sell locally produced electricity and related services. It is widely seen as the most dramatic effort to revolutionize the electric sector now underway in the U.S. Both states are often on the vanguard of energy policy innovations. In New York, by placing a value on distributed energy, the state is acknowledging that the resource offers system-wide benefits that aren’t readily reflected in today’s electricity pricing. Without recognition of these values, distributed energy resources cannot always compete on equal footing with centralized generation. The current mechanisms to price these distributed energy resources are a “blunt instrument,” which don’t show the full value that the resources can have on the wider system, said Audrey Zibelman, outgoing chairman of the New York Public Service Commission. “We need to recognize that today as we sit here we don’t really appreciate the full value that these resources can provide to the system. And we certainly don’t want to undercut their value by our innocence,” she said during a preamble to Thursday’s vote by the commission. Distributed energy resources create benefits for the electric grid, which in some cases go unpaid or are underpaid. These include peak shaving, load shifting, grid stability, reactive power and fast response — “all of those things that are going to be really, really important as we think about moving toward a much less carbon-intensive electric sector,” Zibelman said. 1) Recognize that net energy metering provides an important role for certain resources, and preserve those elements of net metering that work. 2) Provide regulatory certainty so that businesses can adjust to change, and avoid the kind of disruption that occurred in Arizona and Nevada when net metering rules were changed. 3) Take into account the social justice implications of distributed energy and ensure that low-income consumers share the benefits, especially since markets are likely to mature unevenly. New York’s move to decentralize the electric grid sprang from devastation and power outages wrought by Superstorm Sandy in 2012. 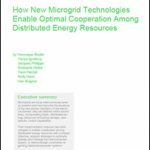 Distributed energy – microgrids in particular – offer reliable back-up to the central grid during outages. Fittingly, the commission opened the proceeding talking about a wind storm this week that caused widespread power outages in western New York. Severe winds moved from the northern Plains through the Great Lakes into western New York and left 1,851,719 customers across seven U.S. states and southern Ontario without power, according to U.S. Department of Energy. Power is not expected to be restored to all customers until early next week. The meeting also marked Zibelman’s final day on the commission. Zibelman is widely seen as a chief architect of the state’s electricity reform efforts. She is leaving to head the Australian Energy Market Operator (AEMO). As revolutions go, New York’s electric overhaul, so far, has proven relatively peaceful, according to Zibelman. At the start it looked like it might go that way in New York too. “In the beginning people sat on other sides of the room. It was always clear when you walked into a collaborative who were the utilities and who were the DER providers and where was the staff. By the end it become really unclear…it was a real conversation as opposed to a debate,” she said. Track news about distributed energy resources by subscribing to the free Microgrid Knowledge newsletter.